Note: I know I am posting twice in 24 hours. I deleted the first post so that I could post this one for payment, thinking that if I deleted the post that was OK; I then realized that doing so is still against the rules. However, entirely_cliched has given me permission to do so, since it was just a mess up with the first post. -Somebody bought two of the sets on Noppin. -Noppin was mean and silly and refused to let atlantia_rai buy the other sets. -We already have the invoice for those sets! So, since we only have 3 sets, this means that not everyone is going to get what they claimed. I edited the list and put everything in order of when people posted their claims. If that puts you in the first three sets, that means that you will get the figure that you asked for! Some people ended up partially in set 3 and partially in sets 4 or 5, which means that they will only get some of the figures that they asked for. So, here is the original claims list. If you are in sets 1, 2, or 3 on this list please read the rules/spreadsheet for your payment info. If you are in sets 4 or 5, you are at the top of the waiting list in case we find more sets. EDIT 2: We got ANOTHER 2 sets, so I have added sets 6 and 7 to this list. Payment info will be up shortly. Also, we need some more claims for Flareons and Eevee, so please post here if interested! Also, if you wanted two figures as a pair (or something of the sort) and would like to revoke your claim, please let me know immediately! Hi guys. here is the next batch of payments. if i get all money within the next 48 hours i can get noppin to ship it before they close for new years. Please note: we are only able to ship this via airmail as noppin are packing as tightly as possible. otherwise we might have had to go for EMS which always has an extra fee when i've used them. when packages arrive i will inform people if there are any problems with their plushes as long as i have their permission to open the little bags. please send payment to alexhughes92@hotmail.co.uk. make sure to include your username and which item/s you are paying for. also please make sure the shipping address is correct on it as that is the address i will be shipping too. As well as Maractus Starly, Buneary, Buizel, Swampert, and Vigoroth for a good price (and preferably ordering the bulk of them together to save on shipping). I'm also looking fo DP Generation Sette of Dawn, Zoey, and possibly other characters/gym leaders! I snagged some pictures of Epcot's current stock of pokemon plush. It's ALL black and white plush so NO METAGROSS! Prices do not include shipping or pp fees. 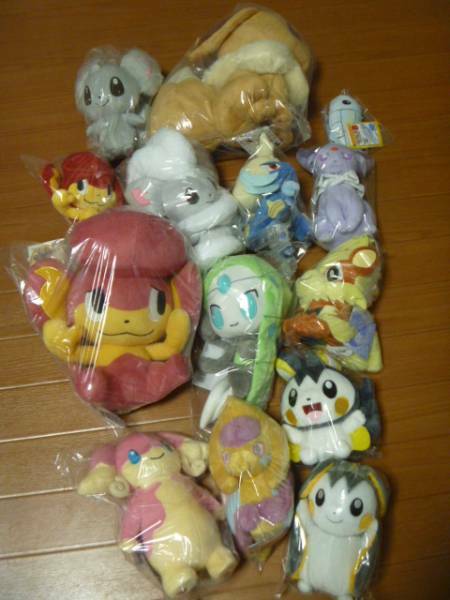 Shipping within the US estimates to about $3 ($5 International) and about +$1 for each added pokedoll. Items won't be shipped until January 2nd! Hey guys, I hope everyone had or is having happy holidays! I received an awesome package from killmeneko that I opened on Christmas morning, and I thought why not show you guys? 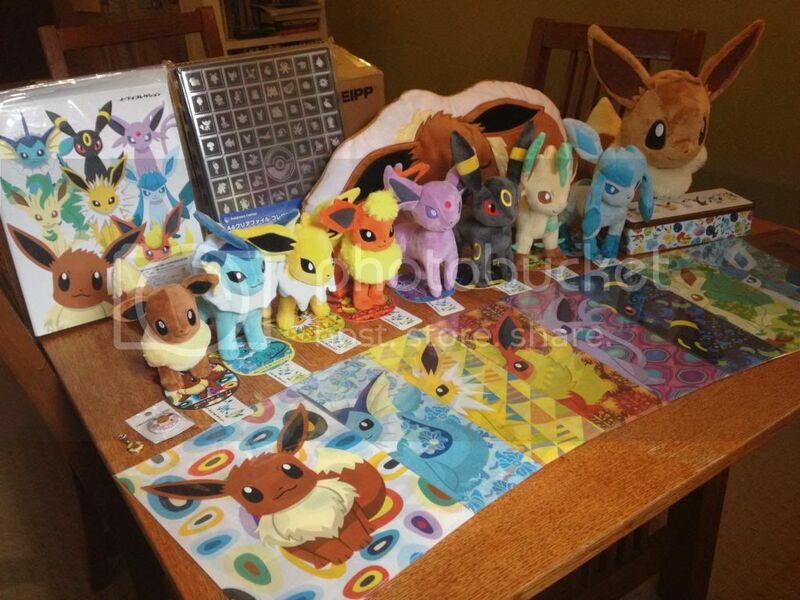 Now I know that we've all seen most of these items a lot recently, but there are a couple things - namely the clear file display case and the Eevee Collection TCG binder - that I haven't seen much of yet. I can't say I have the best lighting and the best camera, but I do have some photos that I'd like to share! Also some Boundaries Crossed sales including Landorus EX FA, Keldeo EX, White Kyurem EX, Black Kyurem EX, White Kyurem EX FA, Crystal Edge, Crystal Wall, Charizard holo, and more! So I got a few Pokemon gets for Christmas! Also, a few things that weren't for Christmas, but have come since. These aren't all of them, I still have one or two things on their way, so I'll make another post before I go back to school. Looking to buy: American Glaceon Poké Doll! Please forgive this shortest of posts; however, I am currently searching for one particular item. The American version of the Glaceon Poké Doll! I would very much prefer to have it MWT. I am more than happy to spend around $20-$30 shipped for one! I am within the US. Please let me know if you have one for sale! Thank you!